Hola kitties! Ready for my first amazing facts' post of 2019? If you're not, you should rev up for this one. I'll give you a few minutes by sharing some gossip. The peeps left me all alone Sunday to go to some annual family reunion thing. Some of you may have made it to my big wingding in their absence. I understand Pop took another fall and he wasn't even drinking. He just got the foot x-ray results from last week. Nothing is broken but he may have a torn ligament. Anyhoo, the swelling is almost all gone. Then there was TW and the Great Litter Box Fiasco. Heh heh. 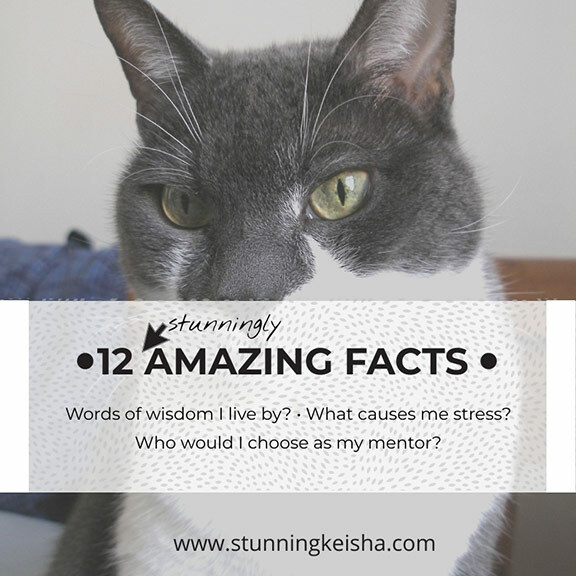 OK, you ready for a dirty dozen amazing facts? Coming right atcha. The Rainbow Bridge. I have a lot of furrends who have run there. It would be nice to visit with them for a spell. I certainly wouldn't want to live there right now. I may decide to retire there many years from now. One TW sings which goes like this. "It's time to feed The Cat, feed The Cat. / Step right up and feed The Cat." While TW's voice drives me crazy, the lyrics speak to me and make me happy. Tuna. Tuna makes the world go round. Salmon too. Tonight's turkey sammich made my world go round. Dumping cats. If it's not illegal, it should be. Poor little tame Panera was dumped in a small park near us. Luckily she found a forever home before the weather got really cold and snowy. Cruelty to cats and other non-human creatures would also be illegal and punishable by death. TW doesn't believe in the death penalty. I do. Advice from people who aren't perfect and aren't cats. I don't want to hear that certain foods are too salty or too spicy for me. I'd rather live a shorter life filled with good food than deprive myself. Dog food. You couldn't pay me to buy dog food or dog toys. Yet brands send these things to me. What causes the most stress in your life. TW, of course, with a flashy box in her hands. Can't live with her; can't live without her. Yes. I need TW to stop saying "no" and start saying "yes." I also need to hear the word "stunning" around the condo more often. For some reason, TW is afraid to say the word stunning. "Whoa, Woman, you did a great job on my new post." I don't think I've ever said that and prolly never will. If you could choose anyone, who would be choose as your life's mentor? Er, Me? I don't know of anyone else that I'd choose. 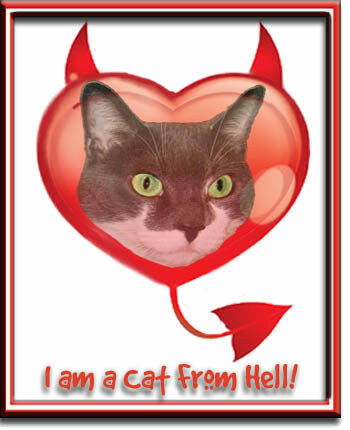 Nellie was kinda a mentor and I was honored to be awarded a Cat From Hell badge. Stunning: The Story of a Famous Internet Cat. Alternate title would be: I'm Not Just an Internet Rock Star, I'm a Legend. Those are awesome facts, CK! My mentor, of course, was Sparkle... although I never met her and just got her notes. Plus, I didn't follow all of her advice, or I'd never have become a therapy cat. All very interesting facts about you. It's sad that TW causes you so much stress. Something must be done about that. Maybe you could sit on her flashy box. CK, what if engineers create a flashy box for cats to use?!? Then, you could chase TW around, and give her a taste of her own medicine! HA! Those are great facts. It would be lovely to be able to visit fur family and friends at the Rainbow Bridge knowing you could come back home again.
" Tonight's turkey sammich made my world go round." We enjoyed reading those CK and agree with the no cat dumping!!! These are really great questions. Lexy was my mentor. She taught me how to be an indoor cat and love having fun. I'm so glad you're doing these again! We love learning more about our favorite feline friends. Putting it on our calendar! I never use the flash on my camera because it makes a racket popping up and the cats run MOL!!! We love those facts about you, CK. Especially the one about the Rainbow Bridge. It sure would be delightful and amazing to be able to visit. Sorry to hear about Pop taking a fall again. We hope he did NOT tear a ligament. That's no fun at all. Always Be Biting. MOL! And I totally agree with you on dumping cats. CK, my darling grrl furrend! Mes would loves to takes yous on a tour at the rainbow bridge! Wes could sip merowgrettas at the Kitty Kat Klub and watch the man cats strut! Mes so furry happy that if yous had a mentor it would be mes. Yous knows that mes encourages biting to keeps the humans in line (and just because). Mes still thinks yous is a magnificent Cat From Hell! Keeps up the good work! I always love to get a kitties view on things and I couldn't agree with you more.